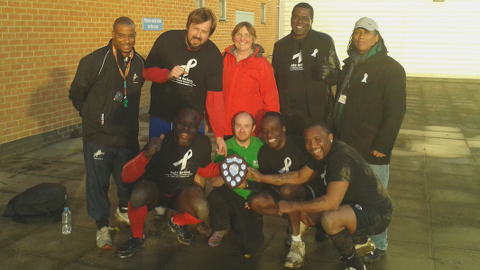 Lewisham community members participated in a charity football match aimed at raising awareness for a global campaign to end domestic violence against women. Members of Lewisham’s Neighbourhood Community Safety Service and a team compiled by the Young Mayor of Lewisham braved freezing conditions on Wednesday afternoon for the five-a-side game. 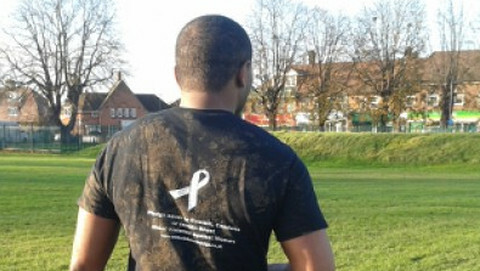 The match, aimed to raise awareness for White Ribbon Week, took place at Bellingham Leisure Centre. Players were keen to speak to EastLondonLines at half time about the importance of White Ribbon Week, and how sports can be a useful way to get men involved in the campaign. The match burst into life shortly before half time, with a flurry of goals making the score 2-2 at the break. However, the NCSS team took control against their younger opponents in the second half to run out 6-3 winners.